The business jet community’s annual ‘grand mass’ in Europe held in late May this year rumbled with positivism about the status of the industry going forward. Following many years of ups and downs, observers and stakeholders held the view that the industry was well on its way to a full recovery. These good signs are headed the right way for satellite players too as they are intimately tied to the inflight connectivity providers’ good fortunes, who have shown an upbeat sentiment about their prospects in the business jet satcom market. While OEM leaders are talking increases in production rates over the next decade, IFC providers are riding the wave and ramping up product development and roll-out to meet the expected higher IFC demand that comes with better fortunes in this industry. In its Aeronautical Satcom Markets, 6 Edition report, NSR stated the addressable market for business jet connectivity was set to grow to over 29,000 airframes in 2027, up from 22,000 in 2017. What is more telling is that in the mix, broadband units will be the fastest growing part of the market and as NSR noted in 2016, business jets are “a market ripe for HTS connectivity”. The installs finally came through in 2017, and OEMs are making more deals to have IFC outfitted on the production line and migrating airframes to higher bandwidth systems. Inmarsat, which as early as 2012 touted more bits for the same cost to business aviation users on Global Xpress, reached a milestone with its Jet Connex business aviation product. It announced 275 GX installation at EBACE 2018 and with close to 300 aircraft online now, it is serious competition to ViaSat’s FSS Ku-band Yonder network, which has over 400 units flying on it, although it is likely to wind down to give way to GEO-HTS Ka-band service. Indeed, ViaSat announced last year a new Ka-band antenna and won the confidence of large OEM Embraer to install it on the production line for Legacy 450 & 500 aircraft that will use ViasSt-1, -2 and Eutelsat’s KA-Sat satellites. And more service providers have inked deals, such as Panasonic with SD to push its services in the converted airline market, and GoGo that entered the broadband satcom market with contracts to retrofit 2Ku on ACJs for Delta Airlines and K5-Aviation airframes. 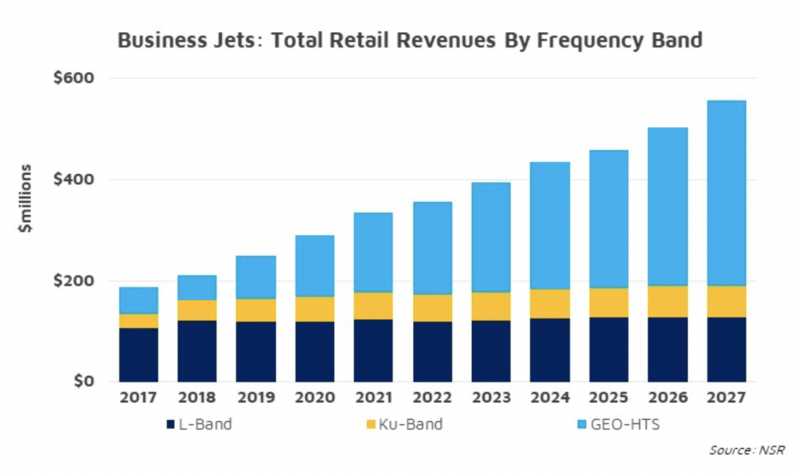 Today business jets are mostly served via L-band, but figures shown in GoGo’s Q2 results point to an uptick in higher bandwidth ATG solutions as it added close to 500 airframes on its network, notably for next-generation AVANCE L5 solutions installed on 200 jets since early this summer. These resulted in a 28% year-on-year growth and record revenues for business aviation which, according to its CEO, ‘elevated’ GoGo’s second quarter results. If we add to the picture the trend towards connectivity on smaller business jets, then we will see the market easily reaching over 4,000 satellite-based broadband units by 2027. OEM deals, new products and higher capacity systems are taking business jet connectivity to new heights, and the prospects for continued growth in this highly demanding market are better than years gone by. With the timely healthy prospects for the business jet market, the growth will help broadband demand surge and unleash more IFC to the benefit of the satellite players.